Between the Pile Gate and the Franciscan Monastery, right next to the entrance to the City walls, lays the small votive Church of Holy Savior. 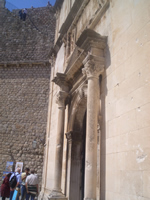 The church was built right after a short lasting, but horrifying earthquake by the decision of Dubrovnik Senate in 1520. 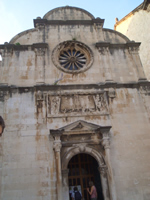 The church was built to please the God and thank the Savior for sparing the City from any damages in the strong earthquake that struck Dubrovnik. Also the monumental inscription on the church frontispiece accounts to those well documented facts. It is interesting to notice that for building of this votive church even the noble ladies carried stone and wood in order to help appease the Higher powers. The construction of the Church of the Holy Savior started in 1520 and was completed in 1528 according to the design of Petar Andrijić, a master architect from Korcula whose family is quite famous for their magnificent stone carving tradition. Many buildings in Korcula have been built and decorated by members of the Andrijić family. The church was not damaged in the Great Earthquake of 1667 hence it remains in its original form. 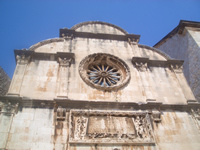 Although the church has some Gothic elements (cross-ribbed ceiling and the side windows with pointy arches), it is a good example of a Dubrovnik Renaissance building. The frontispiece contains prominent Renaissance elements both on the portal and the three-leaved semi-circular ending; in addition, the proportions of the church, semi-circular apse, the complete picture reveals a clear and recognizable Renaissance building model. In the time when Dubrovnik was built there was no cement. Therefore for building of this church the mortar was strengthened with milk and egg whites.